Nok Sariga Jik Sap (Celestial Magpie), hand carved from Mai Payung Dam sacred Treewood, a rare black anomaly of the Payung Tree, which occurs only once in 100,000 trees (circa). The Payung Dam black colored tree is believed to have the most powerful and rare to appear on earth spirit entity inhabiting the tree. This 'Krueang Rang' (Talismanic Occult Bucha item), is a compendium of different ancient animist charms bound into one single Wicha, for Kaa Khaay, Maha Pokasap, Metta Maha Niyom and Maha Sanaeh Magic. The amulet is empowered the Wicha Sariga Jik Sap (Magpie pecking up treasures) for Maha Pokasap Wealth Accumulation, for which Luang Por Kane was so immensely famous for. 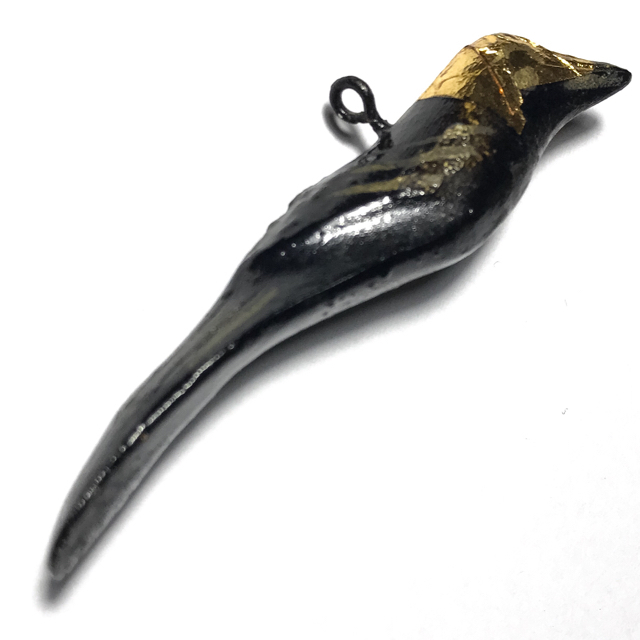 The Sariga bird has a pendant hoop for hanging in the place of business, or in your car, or wherever you wish to attract the favour and preference, and interest of others. It can also be attached to a chueak kart aew waist-cord belt if preferred to be worn as an amulet, or even encased within waterproof casing with pendant ring. The Sariga (sometimes also called 'Nok Garawaek') bird is empowered with spells with the Invocations of Maha Sanaeh, for Seductive Charm, and Maha Pokasap for Prosperity. The Amulet measures 7.5 Cm in length. Very popular with shopkeepers, men or ladies can use equally successfully for seductive influence, mercy charm, good business, and increased popularity. Luang Por Kane was also famous for the Wicha Sai Dak Sap treasure-Trawler charm; The Sai Dak Pla Sek trawler trap is a very ancient fishing trap of Thai people, and is a symbolic attractor of wealth and good business. The Sai is a wicker woven basket which has a valve-like one way trapdoor, which allows fish to swim in, but not out again. The Sai hence represents a container which can have wealth coming in, but which does not leak the wealth out again (Ud Sap/Maha Pokasap). The 'Sai', is an Olden Days invention of Thai Farmers, who in the months after the harvest, when nothing was left to do until the sowing season, would use the spare time to find other ways to find food or things to sell. They would scour the surrounding areas, the marshes, streams rivers and ponds, for fish. The Sai was a basket made with two special openings in it, where fish could swim into the basket, but were not able to swim out aqain, effectively imprisoning them until enough fish were inside the basket to take to market, or to go home and eat, or both. For visualisation of applied magickal effects onto amulets, with meditative force, the formula of using the shape and form of the Sai Fish Trap basket, is perfect, for envisionment of money or treasures entering the trapdoors of the Sai Fish trap (now a magickal money trap instead). One should envision the Sai Dak Pla Sek reeling in the treasure, as the basket fills, and becomes full to the brim with desired possessions and wealth. The allusion is obvious, that the Sai will allow wealth to enter into your possession, but not allow it to slip out through your fingers anymore, and keep it safe, and on the increase. This is what you should envision whilst praying to the Sai Dood Sap, and chanting 'Ehi Jidtang Bpiyang Ma-Ma', whilst thinking 'come to me all of these things'. Luang Por Kane, of Wat Tham Khao Ito, was one of the Great Gaeji Ajarn Guru Master monks of the Prajinburi Province, who was highly revered, and reputed to possess 'Apiniharn' Abhinya powers. In the days of Luang Por Kane, Prajinburi was a 'closed Province' which was not very developed, and still very little infrastructure was introduced. The temple of Wat Tham Khao Ito itself stands on a mountainside, and was even less accessible. The daily dawn alms rounds were a very difficult task to perform in those days for any monk, to be able to find enough house dwellings along the route to collect their daily food alms. Despite this. Luang Por Kane would appear at the households which were far flung through the forest for alms without fail every dawn. There are many miraculous legends about this great Master, such as the one of a Devotee from Bangkok travelled to Prajinburi to visit relatives and also to pay respects to Luang Por Kane. The devotee rose early and arrived at the temple as it was still dark before dawn, and saw Luang Por Kane walking out of his Kuti hut. After offering alms, Luang Por Kane said 'I shall be on my way now as the devotees in the forest hamlets are waiting for me, and i have some business to attend to'. The devotee then returned back to his relatives home in Prajinburi (about 20 minutes away), and after about 30 minutes, his friend called him from Bangkok. His friend in Bangkok said that he had seen Luang Por Kane in Bangkok temple and payed respects that morning. The devotee was astounded, wondering how on earth Luang Por Kane would be able to reach Bangkok in less than an hour on foot, when it took a good 3 hours or so to drive there. But the devotee didn't say anything to his friend. When he put the phone down, the devotee decided to go back to the temple to see if Luang Por Kane was there or not, because it would be impossible for him to go and return from Bangkok in the time period. But the devotee was once more astounded to find Luang Por Kane sitting in his Kuti Hut. The devotee was about to ask Luang Por Kane about the matter, when Luang Por Kane interjected before he could ask, and said 'I walked there and back myself'. Luang Por Kane then instructed the devotee to go back to his relatives home, as they would be worried about him. The devotee was once more astounded, as he realized he had left the house without informing anyone where he was going, and that indeed, they would be wondering where he was, and worrying about him. 'How did Luang Por know?' he thought, and his devotion, respect and faith in Luang Por Kane rose, as he realized that Luang Por was a truly attained Master. Another devotee once came to look for Luang Por Kane, and was told that Luang Por was up in the Tham Khao Ito cave meditating. The devotee climbed up to and entered inside the cave, and saw Luang Por was chanting prayers and meditating there. But what was amazing, was the fact that Luang Por was floating about one meter high in the air as he was chanting, and remained there for some time, finally floating down to come to rest on the floor in meditation posture. An air force pilot from the Jakra Pongs Base in Prajinburi also claims to have seen Luang Por Kane performing Bintabat alms round in the clouds as he flew his plane. Luang Por Kane was an Olden Days Gaeji Ajarn who was of superior age than the great Luang Por Jong (Wat Na Tang Nork), and Luang Por Ia of Ban Dan, who were also two of the greatest masters of the Indo-China wartime Era. Luang Por was born in the year 2402 BE, and lived 111 years, until his passing in the year 2513 BE. 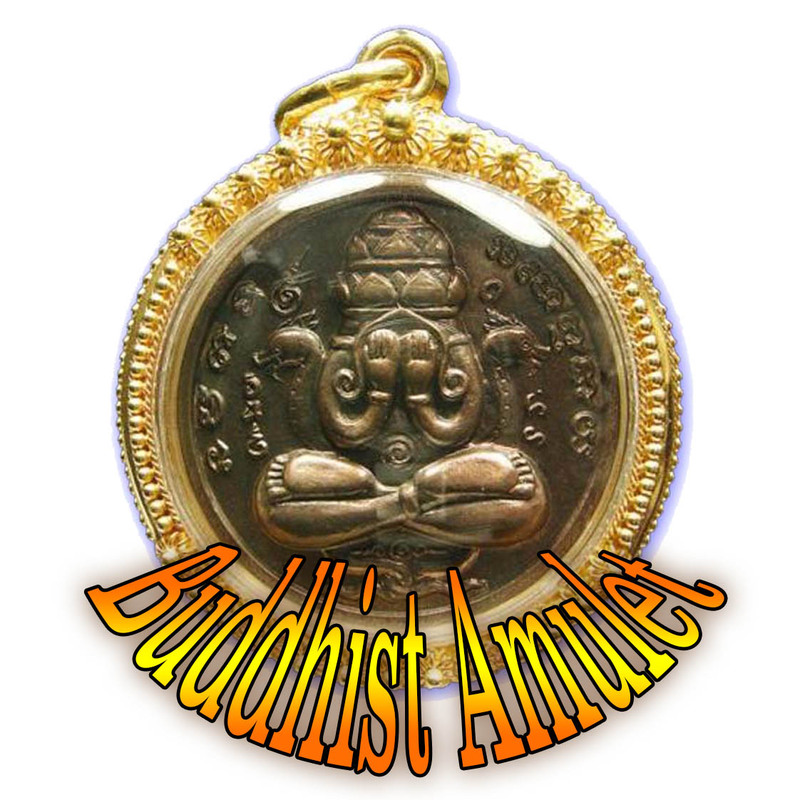 His amulets and occult charms are renowned to possess very powerful Metta Maha Niyom, Kaa Khaay, Maha Lap, Maha Pokasap. He was famous for his Sai Maha Pokasap, and Sum Riak Sap Money traps, and carved Sariga, Garawaek and other birds (such as Nok Kum), mostly carved from Ga Hlong Tree wood. 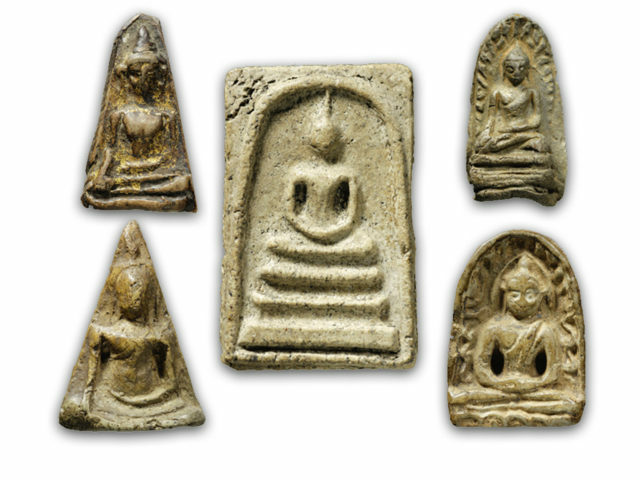 Most of the aforementioned amulets would be made by the hand of Luang Por Kane himself (self carved and inscribed). Other amulets released in various editions by Luang Por Kane were The Sai Dak Pla Sek, an array of Roop Tai blessed photos, in large for men, small for ladies, and also in heart shaped locket form, and the Pong Roop Muean Ha Liam in Muan Sarn Sacred Powders. The 3 models of Rian Roop Muean were Rian Roop Muean Dork Jig, Rian Roop Khai, and the Rian Sema. The 5 kinds of Chanuan Muan Sarn materials in which they were made were; Tong Daeng Rom Dam (Blackened Copper), Tong Daeng Galai Tong (Golden Galvanised Copper), Tong Daeng Galai Ngern (Silver Galvanised Copper), Albaca Galai Ngern (Silver Galvanised Albaca), and Pure Albaca. Then close your eyes, and pray to the Mae Ga and Por Ga tree spirits, and Luang Por Kane to bless you with prosperity, good business, good luck, and great treasures, to send customers, gifts and windfalls to you, and to prevent any accumulated wealth from diminishing. Bessech the blessing of Mercy Charm, that people will see things your way, decide in your favour, and give you favourable treatment.